You'll never guess the state with the highest average heel height in the nation. Where does your state stand? 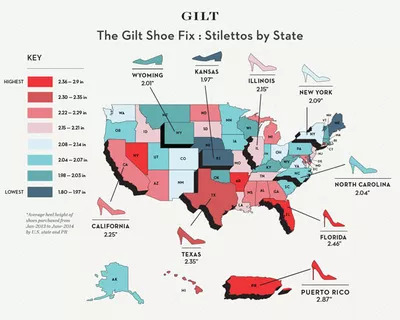 Marilyn Monroe famously said, “I don't know who invented high heels, but all women owe him a lot.” Floridians would probably agree —since shoppers in the Sunshine State rock the highest heels in the nation, according to an analysis by popular shopping site Gilt. I would have bet my Jimmy Choos (if I had a pair) that New Yorkers teeter higher than most. It was Manhattanite Carrie Bradshaw who made running in stilettos look like a normal thing to do, after all. But surprisingly, New York didn’t even crack the top 20! Puerto Rico, Nevada, and Arkansas round out the first tier. Then come Texas and Connecticut, followed by a handful of states in the 2.22- to 2.29-inch category: Arizona, Alabama, California, Georgia, Maryland, Mississippi, Michigan, and North Dakota. As any height-loving lady in these places would undoubtedly attest, fabulous heels can make you feel like a million bucks. Sadly, they can also wreak havoc on your feet. Here's a few ways to keep the damage in check. Shoes that pinch in front can cause Morton's neuroma—a thickening of nerve tissue between the metatarsal bones that causes burning pain in the ball of the foot and/or between your toes. Heels with a wider toe box are easier on your feet. It’ll help absorb the impact of your foot hitting the ground, preventing some of the shock from reaching your knees. A fun brand to try: Taryn Rose. The shoes are still cute, plus they include special cushioning technology that keeps things comfy. Over a number of years, wearing heels can actually shorten your Achilles tendon, according to a 2012 study in The Journal of Experimental Biology. To balance out tightness in the Achilles, she recommends that her patients build strength in the front of the leg by tapping their toes while sitting for about 50 reps, three times a day, says sports medicine doctor Carol L. Otis, MD. And don't forget to stretch! Leigh-Ann Plack, DPT, a physical therapist at the Hospital for Special Surgery in New York City, suggests these four pain-preventing moves. Heel Raises: Stand with your feet on the floor about hip-distance apart. Slowly rise onto the balls of your feet; lower your heels to the ground, then rise up onto your toes again. Repeat for 1 minute, or for about 30 reps.
Toe Stretch: Sit down and extend your right leg so your right heel is on the floor. Pull your toes up and back toward your ankle so you feel the stretch in the arch of your foot. Hold for 30 seconds; switch sides. Repeat three times. Towel Scrunches: Sit barefoot on the ground or in a chair with your feet placed on top of a towel. Now use your toes to keep “scrunching” the towel toward you for about 30 seconds. Repeat two or three times. Calf Stretch: Place your hands on a wall with your left foot behind you. Gently lunge forward with your right leg while keeping your left leg straight and your left heel on the ground. Hold for 30 seconds, then switch legs. Repeat three times.